With HackMyResume you can easily generate polished résumés and CVs in HTML, Markdown, LaTeX, MS Word, PDF, plain text, JSON, XML, YAML, smoke signal, carrier pigeon and other arbitrary-format resumes and CVs, from a single source of truth—without violating DRY. You can convert resumes between FRESH and JSON Resume formats and validate resumes against either format. 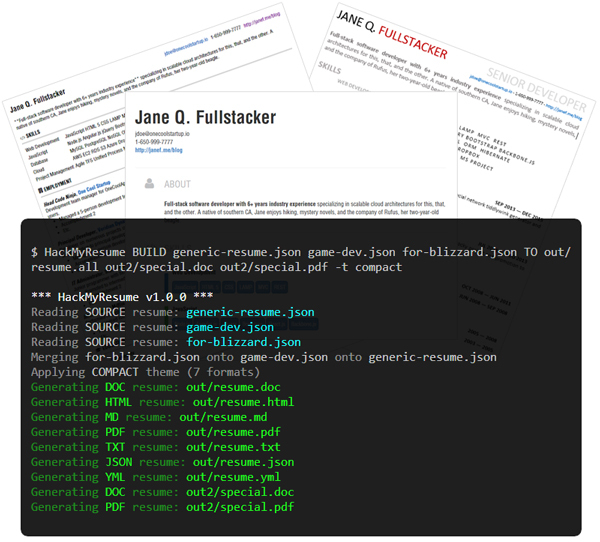 HackMyResume is built with Node.js and runs on recent versions of OS X, Linux, or Windows.